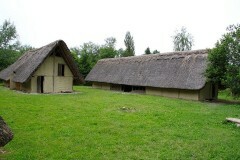 The Musée Romain de Vallon has the largest Roman mosaic in Switzerland while the Village Lacustre in Gletterens on Lake Neuchatel has prehistoric reconstructed stilt houses. 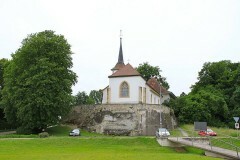 The Roman Museum in Vallon and the Stilt-House Lacustre Village in Gletterens are two minor sights on the eastern shores of Lake Neuchatel near Payerne, Avenches, and Estavayer-le-Lac. The Musée Romain de Vallon is the more interesting with Roman objects and the largest Roman mosaic ever found in Switzerland. The Village Lacruste have four pile dwellings reconstructed on original pile holes found on the shores of Lake Neuchatel. These two historic sights make pleasant side trips from seeing more significant sights in the region. The small Musée Romain de Vallon opened in 2000 on the site of a former country estate of a rich citizen of nearby Aventicum (now Avenches), which was the Roman capital of Helvetia. The main reason for this Roman museum, only a few kilometers from the Roman Museum in Avenches, was the discovery of two large mosaics. The larger mosaic shows a hunting game and at almost 100 sq m is the largest Roman mosaic thus far found in Switzerland. This mosaic dates from around AD 220 and is still in its original position on natural ground. It is thus in a special climate controlled room that is cool and humid to keep it in its remarkably good condition. The mosaic is at an angle of 2°, unobservable to the naked eye, to make it easier to clean with water. The smaller mosaic dating from around AD160, is still a decent 25 sq m and shows the legend of Bacchus and Ariadne. Heat damage show that the building and furniture above the mosaic was destroyed by fire. Further exhibits include models of the villa, which was around 2000 sq m, and Roman items excavated on site. 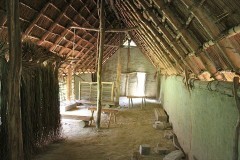 The second floor is used for temporary exhibitions. The Musée Romain de Vallon is open Wednesday to Sunday afternoons from 2 to 5 pm (closing 6 pm from June to September). Admission is CHF6 for adults and CHF2 for children 6 to 16. The Swiss Museum Pass is valid. Combination tickets with the Roman Museum in Avenches are CHF8 for adults. By car, use the Payerne or Avenches exits from Autoroute A1 and follow the road to Vallon. The museum is in the neighborhood Carignan with free parking at the small medieval church right across the road from the museum. 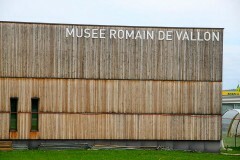 Although the “Vallon, Musée Romain” bus stop is directly in front of the museum, bus services are rather limited but available to Payerne and Domdidier stations and Gletterens a few times per day. 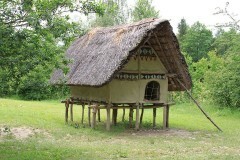 The village consists of only four buildings with the odd implements so can be seen in a few minutes. The Laténium on the opposite side of the lake near Neuchatel city is a far more comprehensive and more interesting venue. The Village Lacustre is open daily from 9 am to 5 pm from May to October. Admission is CHF3 for adults and CHF1.50 for children. The Swiss Museum Pass is valid. Demonstrations are held (and charged for extra) on most summer vacation afternoons. The village is easiest reach by car – follow signs to Gletterens Plage (beach). Free parking is available at the restaurant and Denner supermarket near the site. As a result of Switzerland’s often complicated geographical history, both Gletterens and Vallon are in canton Fribourg, while Avenches, Payerne and most of the eastern shores of Lake Neuchatel are in canton Vaud.